It’s been a fair few years since Brigitte and I spent a Christmas day alone and at home. 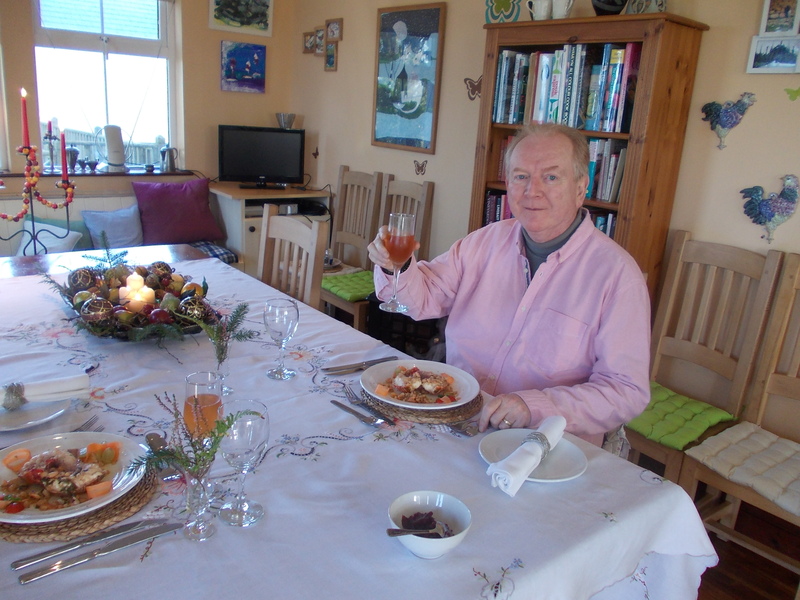 This year we decided to focus on having a great meal and fine wines. When there are but two of us to please, we can do that without compromise. Inspiration for the main course meal came from a TV program presented by Tom Kerridge. This is unusual for me since I don’t usually follow recipes. In this case, I followed his broad strokes but added a few of my own variations. We started with rock lobster tails in a rosé Champagne and prawn sauce. We drank the rest of the very nice rosé Champagne from Oudinot of Epernay. This was from Marks and Spencer at €23 and was one of the better rosé we have had. It was onion skin rather than bright pink and very balanced. Not too sweet. The main was a rolled and stuffed turkey breast. 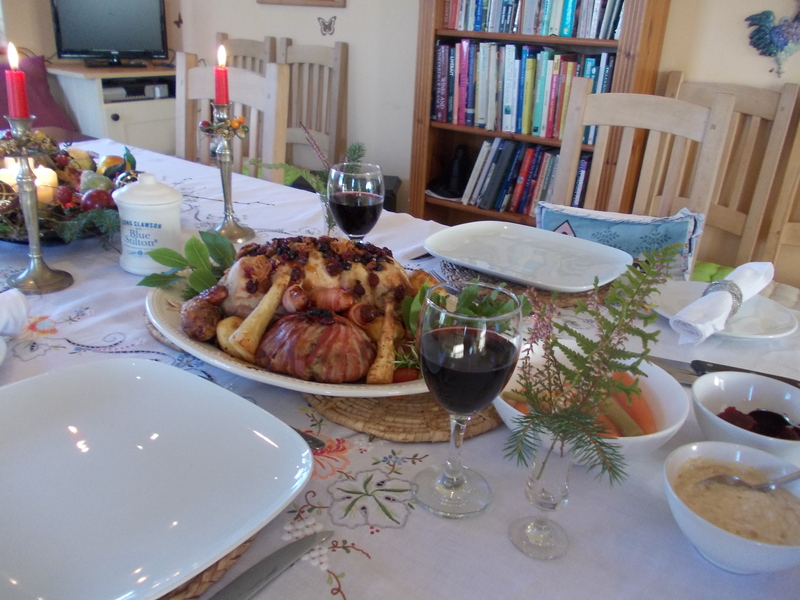 The stuffing was pork sausage, onion, chestnut, cranberry and sage with a dice of turkey and soaked in Madeira wine. The breast was beaten flat, then rolled in cling wrap and cooked in the oven over a bath of water enclosed in foil. This steaming method gave a wonderfully moist and tender roll that was easy to cut. After cooking and resting it was unwrapped, smeared with sweet opinion marmalade and topped with cranberry, blueberry, chestnut and crispy pork crackling. There was a honey roasted slab of streaky smoked bacon to go with this and the usual roast spuds, parsnips, carrots braised with star anise and butter, and pigs in blankets. (Cocktail sausage wrapped in bacon.) B made her wonderful bread sauce to go with the cranberry jelly on the side. We drank a bottle of Chateauneuf-du-Pape from Leon Perodigal from Asda. At 14.5 %, this was a heady wine that left us both feeling what we are pleased to call: squiffeloid. 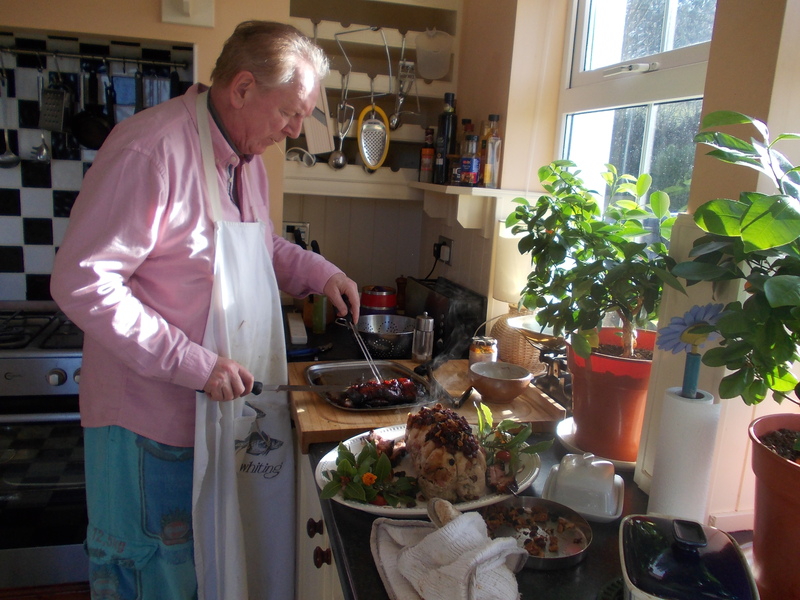 Pudding was also a Tom Kerridge recipe: orange sponge served with plum sauce (Made with frozen plums from our own tree.) and freshly made full-cream icecream infused with Christmas pudding. As Kerridge would say; ‘it wa proper lush’. A long sit before the fire and an early trip to bed followed this indulgent and much enjoyed meal. Even so I could not stay away from the Mac and did some work and editing on the Bonny novel, nearing completion now. I can’t seem to do a day with out some kind of writing. I do hope all who celebrate this holiday had such an enjoyable feast. Even those of you who had to cook it! It sounds as if you really enjoyed that! How do you freeze plums? Do you take the stones out first, or do you do that after you defrost them? B did it and she says whole is best. Once thawed they are easy to stone before using. I hope you understood the reference to slang on your post about that. When editing Animal you left a comment saying my use of the word ‘Tosh’ showed it was an Irish setting. That puzzled me since the word is very English. I really loved your post about Jerusalem at Christmas. No, it wasn’t the use of the word “tosh.” It was the phrase, “Would you listen to this.” Sorry I didn’t make that clear. Thanks for the advice from B and glad you liked my post.